Watch this space for future equipment availability! AT 4 ALL! As many may know, Assistive Technology (AT) can be invaluable to people with disabilities. Unfortunately, AT is sometimes too expensive, not covered by insurance or the wait is too long to obtain the items. Because of this, several programs statewide offer equipment loaner programs. Check with your local CIL to see if they have such a service or can refer to another program. In addition, there is a statewide website which contains inventory and information about many products that are available to loan. The website is idaho.at4all.com. If you need assistance with the website, you can contact your local CIL. Terms for borrowing or accepting donations may be different for each program, so please make sure you contact the agency prior to your visit. 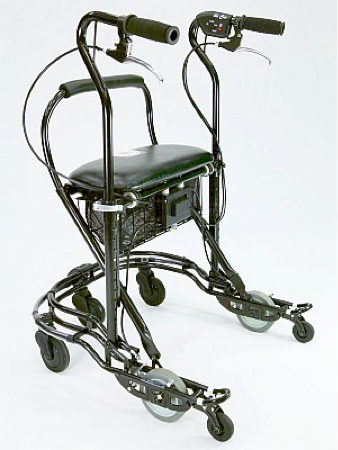 U-Step Walker II. 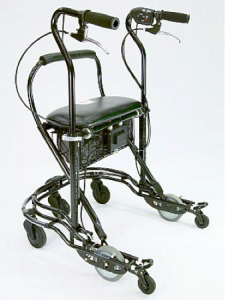 The manufacturer suggests it is a product that will stop falls and increase mobility. The device is suggested for people with Parkinson’s or those who need a lot of stabilization when they walk. It may also assist people who are learning how to use a walker, as this particular model has the laser module. This feature illuminates a red line on the floor from one side of the walker to the other, allowing the user to know where to step. See more information about this product at www.ustep.com. If you are interested in borrowing this device, please call James or Mellowdee for an appointment at (208) 883-0523/800-475-0070. Email James@dacnw.org or mbrooks@dacnw.org.